Yellow fever is an acute viral haemorrhagic disease transmitted by infected mosquitoes. The “yellow” in the name refers to the jaundice that affects some patients. Symptoms of yellow fever include fever, headache, jaundice, muscle pain, nausea, vomiting and fatigue. A small proportion of patients who contract the virus develop severe symptoms and approximately half of those die within 7 to 10 days. The virus is endemic in tropical areas of Africa and Central and South America. Large epidemics of yellow fever occur when infected people introduce the virus into heavily populated areas with high mosquito density and where most people have little or no immunity, due to lack of vaccination. In these conditions, infected mosquitoes of the Aedes aegypti specie transmit the virus from person to person. • Yellow fever is prevented by an extremely effective vaccine, which is safe and affordable. A single dose of yellow fever vaccine is sufficient to confer sustained immunity and life-long protection against yellow fever disease. A booster dose of the vaccine is not needed. The vaccine provides effective immunity within 10 days for 80-100% of people vaccinated, and within 30 days for more than 99% of people vaccinated. Good supportive treatment in hospitals improves survival rates. There is currently no specific anti-viral drug for yellow fever. The Eliminate Yellow fever Epidemics (EYE) Strategy launched in 2017 is an unprecedented initiative. With more than 50 partners involved, the EYE partnership supports 40 at-risk countries in Africa and the Americas to prevent, detect, and respond to yellow fever suspected cases and outbreaks. The partnership aims at protecting at-risk populations, preventing international spread, and containing outbreaks rapidly. By 2026, it is expected that more than 1 billion people will be protected against the disease. Once contracted, the yellow fever virus incubates in the body for 3 to 6 days. Many people do not experience symptoms, but when these do occur, the most common are fever, muscle pain with prominent backache, headache, loss of appetite, and nausea or vomiting. In most cases, symptoms disappear after 3 to 4 days. A small percentage of patients, however, enter a second, more toxic phase within 24 hours of recovering from initial symptoms. High fever returns and several body systems are affected, usually the liver and the kidneys. In this phase people are likely to develop jaundice (yellowing of the skin and eyes, hence the name ‘yellow fever’), dark urine and abdominal pain with vomiting. Bleeding can occur from the mouth, nose, eyes or stomach. Half of the patients who enter the toxic phase die within 7 – 10 days. Yellow fever is difficult to diagnose, especially during the early stages. A more severe case can be confused with severe malaria, leptospirosis, viral hepatitis (especially fulminant forms), other haemorrhagic fevers, infection with other flaviviruses (such as dengue haemorrhagic fever), and poisoning. Polymerase chain reaction (PCR) testing in blood and urine can sometimes detect the virus in early stages of the disease. In later stages, testing to identify antibodies is needed (ELISA and PRNT). Forty seven countries in Africa (34) and Central and South America (13) are either endemic for, or have regions that are endemic for, yellow fever. A modelling study based on African data sources estimated the burden of yellow fever during 2013 was 84 000–170 000 severe cases and 29 000–60 000 deaths. Occasionally travellers who visit yellow fever endemic countries may bring the disease to countries free from yellow fever. In order to prevent such importation of the disease, many countries require proof of vaccination against yellow fever before they will issue a visa, particularly if travellers come from, or have visited yellow fever endemic areas. In past centuries (17th to 19th), yellow fever was transported to North America and Europe, causing large outbreaks that disrupted economies, development and in some cases decimated populations. 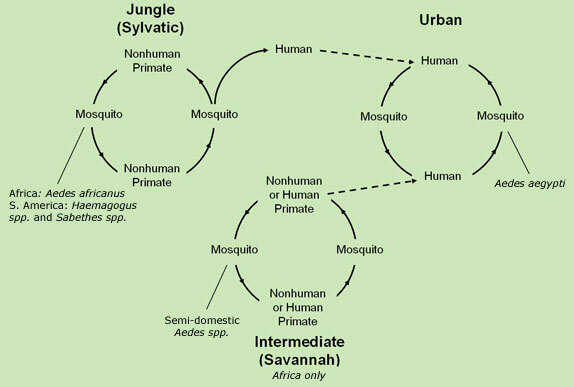 Sylvatic (or jungle) yellow fever: In tropical rainforests, monkeys, which are the primary reservoir of yellow fever, are bitten by wild mosquitoes of the Aedes and Haemogogus species, which pass the virus on to other monkeys. 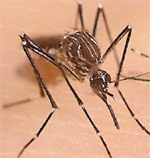 Occasionally humans working or travelling in the forest are bitten by infected mosquitoes and develop yellow fever. Intermediate yellow fever: In this type of transmission, semi-domestic mosquitoes (those that breed both in the wild and around households) infect both monkeys and people. Increased contact between people and infected mosquitoes leads to increased transmission and many separate villages in an area can develop outbreaks at the same time. This is the most common type of outbreak in Africa. Urban yellow fever: Large epidemics occur when infected people introduce the virus into heavily populated areas with high density of Aedes aegypti mosquitoes and where most people have little or no immunity, due to lack of vaccination or prior exposure to yellow fever. In these conditions, infected mosquitoes transmit the virus from person to person. Good and early supportive treatment in hospitals improves survival rates. There is currently no specific anti-viral drug for yellow fever but specific care to treat dehydration, liver and kidney failure, and fever improves outcomes. Associated bacterial infections can be treated with antibiotics. Vaccination is the most important means of preventing yellow fever. The yellow fever vaccine is safe, affordable and a single dose provides life-long protection against yellow fever disease. A booster dose of yellow fever vaccine is not needed. Several vaccination strategies are used to prevent yellow fever disease and transmission: routine infant immunization; mass vaccination campaigns designed to increase coverage in countries at risk; and vaccination of travellers going to yellow fever endemic areas. In high-risk areas where vaccination coverage is low, prompt recognition and control of outbreaks using mass immunization is critical. It is important to vaccinate most (80% or more) of the population at risk to prevent transmission in a region with a yellow fever outbreak. There have been rare reports of serious side-effects from the yellow fever vaccine. The rates for these severe ‘adverse events following immunization’ (AEFI), when the vaccine provokes an attack on the liver, the kidneys or on the nervous system are between 0 and 0.21 cases per 10 000 doses in regions where yellow fever is endemic, and from 0.09 to 0.4 cases per 10 000 doses in populations not exposed to the virus (1). The risk of AEFI is higher for people over 60 years of age and anyone with severe immunodeficiency due to symptomatic HIV/AIDS or other causes, or who have a thymus disorder. People over 60 years of age should be given the vaccine after a careful risk-benefit assessment. people with severe immunodeficiency due to symptomatic HIV/AIDS or other causes, or who have a thymus disorder. In accordance with the International Health Regulations (IHR), countries have the right to require travellers to provide a certificate of yellow fever vaccination. If there are medical grounds for not getting vaccinated, this must be certified by the appropriate authorities. The IHR are a legally binding framework to stop the spread of infectious diseases and other health threats. Requiring the certificate of vaccination from travellers is at the discretion of each State Party, and it is not currently required by all countries. The risk of yellow fever transmission in urban areas can be reduced by eliminating potential mosquito breeding sites, including by applying larvicides to water storage containers and other places where standing water collects. Both vector surveillance and control are components of the prevention and control of vector-borne diseases, especially for transmission control in epidemic situations. For yellow fever, vector surveillance targeting Aedes aegypti and other Aedes species will help inform where there is a risk of an urban outbreak. Understanding the distribution of these mosquitoes within a country can allow a country to prioritize areas to strengthen their human disease surveillance and testing, and consider vector control activities. There is currently a limited public health arsenal of safe, efficient and cost-effective insecticides that can be used against adult vectors. This is mainly due to the resistance of major vectors to common insecticides and the withdrawal or abandonment of certain pesticides for reasons of safety or the high cost of re-registration. Historically, mosquito control campaigns successfully eliminated Aedes aegypti, the urban yellow fever vector, from most of Central and South America. However, Aedes aegypti has re-colonized urban areas in the region, raising a renewed risk of urban yellow fever. Mosquito control programmes targeting wild mosquitoes in forested areas are not practical for preventing jungle (or sylvatic) yellow fever transmission. Personal preventive measures such as clothing minimizing skin exposure and repellents are recommended to avoid mosquito bites. The use of insecticide-treated bed nets is limited by the fact that Aedes mosquitos bite during the daytime. Prompt detection of yellow fever and rapid response through emergency vaccination campaigns are essential for controlling outbreaks. However, underreporting is a concern – the true number of cases is estimated to be 10 to 250 times what is now being reported. WHO recommends that every at-risk country have at least one national laboratory where basic yellow fever blood tests can be performed. A confirmed case of yellow fever in an unvaccinated population is considered an outbreak. A confirmed case in any context must be fully investigated. Investigation teams must assess and respond to the outbreak with both emergency measures and longer-term immunization plans. In 2016, two linked urban yellow fever outbreaks – in Luanda (Angola) and Kinshasa (Democratic Republic of the Congo), with wider international exportation from Angola to other countries, including China – have shown that yellow fever poses a serious global threat requiring new strategic thinking. The Eliminate Yellow Fever Epidemics (EYE) Strategy was developed to respond to the increased threat of yellow fever urban outbreaks with international spread. Steered by WHO, UNICEF, and Gavi, the Vaccine Alliance, EYE supports 40 countries and involves more than 50 partners. research and development for better tools and practices. The EYE strategy is comprehensive, multi-component and multi-partner. In addition to recommending vaccination activities, it calls for building resilient urban centres, planning for urban readiness, and strengthening the application of the International Health Regulations (2005). The EYE partnership supports yellow fever high and moderate risk countries in Africa and the Americas by strengthening their surveillance and laboratory capacity to respond to yellow fever cases and outbreaks. EYE partners also support the implementation and sustainability of routine immunization programmes and vaccination campaigns (preventive, pre-emptive, reactive) whenever and wherever needed. To guarantee a rapid and effective response to outbreaks, an emergency stockpile of 6 million doses of yellow fever vaccine, funded by Gavi, is continually replenished. This emergency stockpile is managed by the International Coordinating Group for Vaccine Provision, for which WHO serves as secretariat. It is expected that by the end of 2026, more than 1 billion people will be protected against yellow fever through vaccination. (1) WHO. Detection and investigation of serious adverse events following yellow fever vaccination, Geneva, World Health Organization (WHO); 2008. 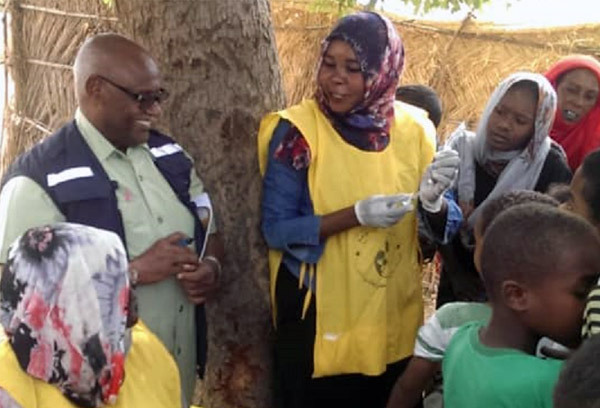 “…..The campaign forms a critical part of Sudan’s ongoing work to protect all populations against yellow fever epidemics, in alignment with the global Eliminate Yellow fever Epidemics (EYE) Strategy. The country plans to complement these yellow fever mass campaigns and ensure long-term protection through the introduction of yellow fever vaccination into routine immunization in the coming months. “We acknowledge the commitment of the health authorities in Sudan to avail cash and fuel during this economic crisis to ensure that their people, especially children, are protected with a quality vaccine which will contribute to health security and making the world safer,” said Dr Naeema Al-Gasseer, WHO Representative in Sudan. Yellow fever – Brazil: From December 2018 through January 2019, 361 confirmed human cases, including eight deaths, have been reported in 11 municipalities of two states of Brazil. Brazil is currently in the seasonal period for yellow fever, which occurs from December through May. The expansion of the historical area of yellow fever transmission to areas in the south-east of the country in areas along the Atlantic coast previously considered risk-free led to two waves of transmission (Figure 1). One during the 2016–2017 seasonal period, with 778 human cases, including 262 deaths, and another during the 2017–2018 seasonal period, with 1376 human cases, including 483 deaths. From December 2018 through January 2019, 361 confirmed human cases, including eight deaths, have been reported in 11 municipalities of two states of Brazil. In the southern part of São Paulo state, seven municipalities:El dorado (16 cases), Jacupiranga (1 case), Iporanga (7 cases), Cananeia (3 cases), Cajati (2), Pariquera-Açu (1), and Sete Barras (1) reported confirmed cases. In the same state, additional cases in Vargem (1) and Serra Negra (1) municipalities were confirmed on the border with Minas Gerais State. Additionally, two cases have been confirmed in the municipalities of Antonina and Adrianópolis, located in the eastern part of Paraná State. 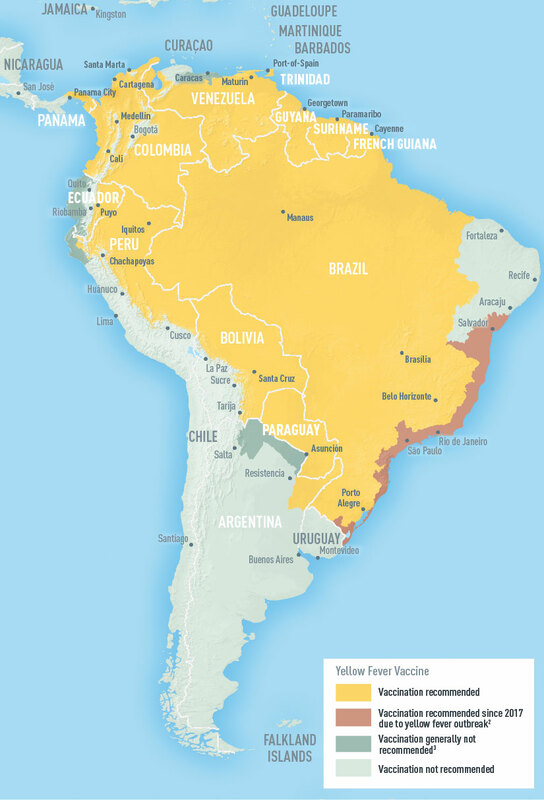 These are the first confirmed yellow fever cases reported since 2015 from Paraná, a populous state with an international border. Among these confirmed cases, 89% (32/36) are male, the median age is 43 years, and at least 64% (23/36) are rural workers. Human cases reported so far during the current 2018–2019 period (July 2018 to Jan 2019) in nine municipalities in São Paulo State, as well as the confirmation of human cases and epizootic due to yellow fever in the state of Paraná, mark the beginning of what could be a third wave and a progression of the outbreak towards the Southeast and South regions of the country (Figure 2). While too early to determine if this year will show the high numbers of human cases observed in the last two large seasonal peaks, there is indication that the virus transmission is continuing to spread in a southerly direction and in areas with low population immunity. PAHO reported 12 new cases of yellow fever in Brazil, possibly marking the beginning of the country’s third wave of yellow fever activity in the past 2 years. Nigeria: Since the beginning of the yellow fever outbreak on 12 September 2017, a total of 3 510 suspected cases including 74 deaths (CFR 2.1%). EVENT DESCRIPTION Nigeria experienced a large yellow fever outbreak from September 2017 to late-March 2018 and since then, sporadic cases continued to occur. However since late-September 2018, a new cluster of suspected yellow fever cases emerged in Edo State, located in the southern part of Nigeria. In week 41 (week ending 14 October 2018), one presumptive yellow fever case was confirmed, followed by three presumptive cases in week 42, and more cases occurred subsequently. Between 22 September and 10 December 2018, a total of 97 suspected yellow fever cases, including 23 deaths (case fatality ratio (CFR) 23.7%) were reported across 15 (out of 18) local government areas (LGAs) in Edo State. More than half of these cases occurred in the last two weeks. ….. Males constitute 58% of all cases and the most affected age groups are 1-10 years (41%), followed by 11-20 years (22%) and 21-30 years (19%). 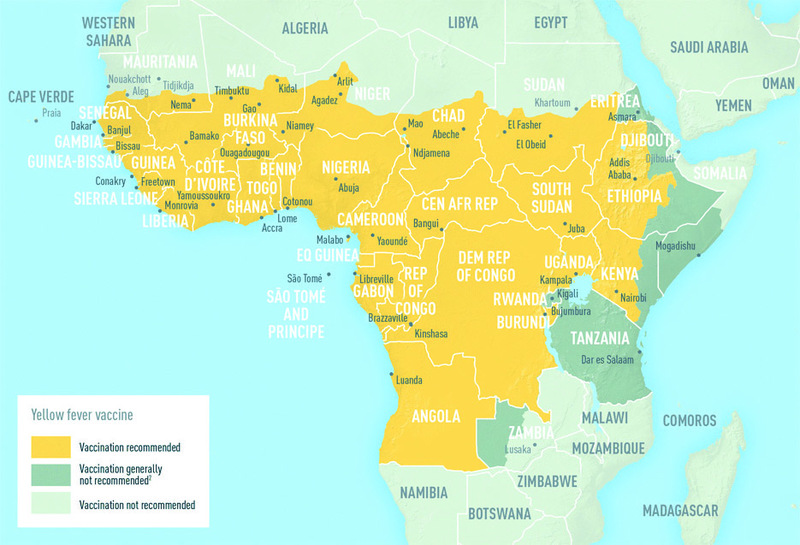 PUBLIC HEALTH ACTIONS The International Coordinating Group (ICG) has approved 1.38 million doses of yellow fever vaccine from the global emergency vaccine stockpile for an immediate reactive mass vaccination campaign, targeting 1.24 million people in eight LGAs. Active surveillance has been enhanced across the country, including active case search and case investigations of alerts. A National Rapid Response Team (RRT) has been deployed to Edo State to conduct epidemiological, entomological and laboratory investigations and support local response efforts. The RRT is working with the state health authorities, WHO and other partners to implement outbreak response activities, including active case search, sensitization of health workers and communities, and entomological surveillance. Implementation of vector surveillance and targeted vector control activities are ongoing, with emphasis on managing Aedes species. WHO is providing technical support to the state and national authorities, including deploying yellow fever experts to support the country response in Edo State. SITUATION INTERPRETATION A new focus of yellow fever outbreak has been confirmed in Edo State, Nigeria, following the large outbreak that started in September 2017 up to late-March 2018. While Nigeria introduced yellow fever vaccine into routine immunization in September 2016, the country remains vulnerable to the disease. The global strategy to Eliminate Yellow Fever Epidemic (EYE) identified Nigeria as a high priority country for large preventive mass vaccination campaigns. Entomological investigations conducted in various parts of the country identified the presence of competent mosquito vectors (Aedes aeqypti). In response to the 2017 outbreak, several rounds of reactive vaccination campaign have already been conducted in a number of states, while a scheduled preventive vaccination campaign is currently ongoing in six states. In Edo State, yellow fever vaccination coverage in children below one year of age is about 69% and approximately 60% in the rest of the population, leaving a significant number of people susceptible to the disease. The current outbreak has occurred close to the state capital, Benin city, which is moderately cosmopolitan, with high population movements due to trade. An influx of persons with low immunity to yellow fever coming from other parts of the country, Europe and America into Edo state for the Christmas holidays is expected. All these underlying issues are significant, calling for the rapid implementation of the upcoming reactive vaccination campaign. Nigeria: As of Nov 25, 2018, a total of 3,510 suspected YF cases, including 74 deaths (the case-fatality rate is 2.1%). A planned yellow fever preventive mass vaccination campaign targeting 20,461,805 persons in six states (Borno, Kebbi, Niger, Plateau, Sokoto and the FCT) commenced on 22nd November 2018. Yellow fever earned New Orleans the nickname “Necropolis” — city of the dead. Floods and a humanitarian crisis: 25 out of 31 of Iran’s provinces have been affected. Officials say say 76 people have been killed so far, with some 150,000 homes partially or completely destroyed. Bridges across the country and miles upon miles of road have been left unusable. A “brand-new type of terrorism:” At least 290 people are now known to have died in a coordinated attack on churches and hotels on Easter Sunday in Sri Lanka. luxury hotels and churches across Sri Lanka were bombed with at least 140 dead and about 600 injured.